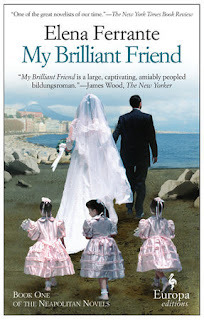 Goodreads says, "A modern masterpiece from one of Italy's most acclaimed authors, My Brilliant Friend is a rich, intense and generous hearted story about two friends, Elena and Lila. Ferrante's inimitable style lends itself perfectly to a meticulous portrait of these two women that is also the story of a nation and a touching meditation on the nature of friendship. Through the lives of these two women, Ferrante tells the story of a neighbourhood, a city and a country as it is transformed in ways that, in turn, also transform the relationship between her two protagonists." It's Naples after WWII and the town is under a transformation. Two young girls, Elena and Lila, find friendship amongst all the chaos of their poor neighborhood. Lila is the smartest girl in school and pushes Elena in various ways, especially with her school work. An education is the best way to get out of the confines of the neighborhood. Their neighborhood is ruled by only the wealthiest while everyone else basically struggles to get by. Lila is different though. She is not only smart, she is bold and challenges Elena to be more, to do more, and say more. 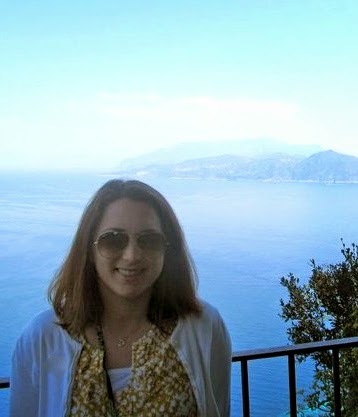 They have plans to write a novel together and leave Naples behind. All that changes though when Elena goes onto middle school and Lila, even though she is more than capable enough to thrive at school, goes onto work as her parents don't want to spend more money on her education. Elena's horizons instantly broaden and although Lila's have done the opposite, Elena still feels drawn to Lila. Elena Ferrante's My Brilliant Friend is an excellent and absorbing depiction of female friendships as well as a neighborhood and the social dynamics in Naples in the '50s. I loved the character of Elena in My Brilliant Friend. Following her struggles in elementary school, her friendship with Lila, and then her continuing her education was really compelling. 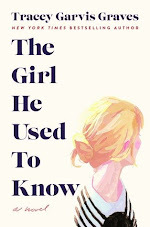 It's not that a lot happens to Elena, but I could appreciate her coming-of-age tale. I also appreciated Elena's struggle with adolescence. I think many young adults could relate to her feelings of being inadequate, her disgust at pimples, her weight, etc, especially in comparison to Lila, who becomes the beauty of the neighborhood. But Elena always have one thing over Lila: her schooling. Speaking of Lila, her father owns the shoe store in town and once Lila's dreams of furthering her education go up in smoke, she makes plans with her brother for becoming successful shoemakers on their own. But they must keep this from their father initially. During adolescence, Lila attracts attention from many of the wealthier members of her neighborhood, and Elena can't help but feel left behind and in her wake, especially when the Solaras start noticing her as they are the wealthiest family in town. Ferrante's depiction of female friendship, the competition, and the highs and lows are all so accurate and moving in My Brilliant Friend. I was completely absorbed in Elena and Lila's tale and was desperate to know what would happen to the girls. My Brilliant Friend also highlights the social injustice for the time period as they lived in such a sexist society. As a woman, I found so much of it hard to swallow. Lila, who is the most brilliant student at her school, can't even continue her education due to her father. Her father was holding her back and it truly made it hard for Lila to leave the neighborhood and make something of herself. The neighborhood of Naples in the '50s was also very interesting in My Brilliant Friend. The poor versus the wealthy and the desire for power was depicted well in the novel. The neighborhood and the different dynamics between the families was utterly captivating. Each family was trying to climb the various rungs on the ladder of success with always the Solara brothers at the top. It didn't help that the Solaras are the bullies of the neighborhood, especially if they don't like you. The narrator of My Brilliant Friend is Hilary Huber and I found her to be just adequate. I think I would have appreciated someone that had an Italian background or even someone who spoke with an Italian accent as that would have added to the atmosphere of the novel and made the story that much more vibrant. Nonetheless, I really enjoyed My Brilliant Friend. I can see why so many critics raved about and I look forward to continuing with The Neapolitan Novels to find out what happens to Elena, Lila and their neighborhood. I am also excited to check out the show on HBO, which is based on this book. Did you see My Brilliant Friend on HBO or read this book? Let me know in the comments below. I've seen this one around a lot, even though it's a few years old, and it does sound like a very interesting story!